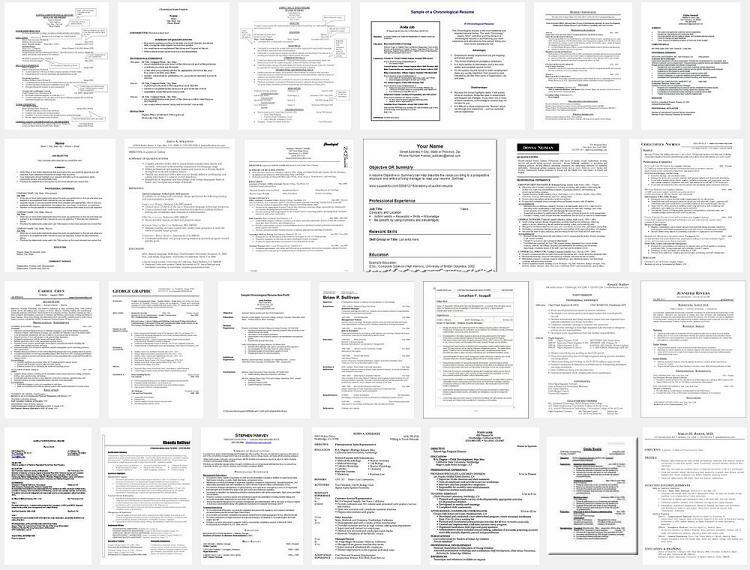 The reliance on the Chronological formatted resume has increased dramatically over the last several years. At one time it was possible to rely on only a Functional, a Skill-based, or other non-Chronological resume format throughout the entire job search process. With almost every firm or small business now relying on some type of online resume storage or search or retrieval tool, it is essential that everyone has a Chronological formatted resume as either their primary or their alternate career reference or marketing document. …you probably see what I see. There’s a “theme” but not a standard. So, let me help you visualize the key basic parts of a Chronological resume: Contact Information, Objective/Summary, Work Experience and Education. Keep your contact information simple and yet modestly complete – just name, address, phone and e-mail. Centered, font size of 11 or 12 (Times New Roman or Arial is fine) with a larger font (14-20) for your name. A single separator line between the header and the rest of the resume is common and provides a clear delineation of the “who” from the “what” of a resume, but it’s optional. If you have very little work experience, are a recent college graduate, or are making a significant career change, then use an Objective statement, otherwise you’ll probably just use a Summary statement. The Objective Statement is 1 or 2 sentences stating what you are seeking or how you can address a specific job requirement while the Summary Statement is 2-4 sentences/bullets and is more about how your experience can benefit my firm or applies directly to the job in question. When you can, use a Summary. An experienced project manager with expertise in road construction and building maintenance. Talent includes developing extensive project schedules, coordinating activities of more than 50 sub-contractors at a time, and successful negotiations with unions, federal agencies, and state auditors. Recent certification in demolitions and detonations allows pursuit of full-cycle demolition/construction contracts. The proper format is REVERSE-Chronological, with the most current work history or jobs listed on the top, covering up to about a dozen years of relevant experience. The number of years you go back is debatable, but seldom more than 20 — interviewers are most interested in your current skills, not your job history. I usually recommend that you lead with your title or role rather than the company name…today, what you are is more important than who you did it for, but listing the company name first is also fine. Make sure you provide the date range you worked at the companies in a standard date format (no dots, no Roman numerals, no unusual abbreviations like “NV” for November, etc.). Then add at least 3-7 points about your job/role. These can be in either bullet or paragraph format…with bullets being slightly more common. Unless you are a recent college graduate with little to no work experience, the Education section is always below your Experience. Recent college graduates, professors, and only a few other exceptions list the education at the top of the resume. Be very clear and very specific. Did you earn a degree or did you just attend? What is the exact designation of your degree? These are looked at very carefully by recruiters, so don’t mislead or obscure your education. If you have certifications or other qualifications, list them in a separate section below Education. The degree you earned is usually more important than the school you earned it at, So, I suggest you list your degree first and the school second — but either way is fine. Now, be careful. This is just a simple “starting point” for a modest Chronological Resume. Read over Chronological Resumes PART 1 and then find yourself a good resume book, popular resume writing software, or a recommended professional resume writer to help you assemble a stellar resume…since a basic resume won’t get you an interview like it used to in the 20th century. Bottom Line: Everyone should have a Chronological resume. It has just 4 basic sections: Contact Information, Objective/Summary, Work Experience, and Education (other sections can be added as appropriate). Keep the Contact information clear and simple, develop an interesting Summary or Objective, outline your Work Experience (bullets, paragraphs or a mixture) back about a dozen years, and provide succinct Education information. I’ve linked the discussions above to further in-depth details if needed, but this brief outline should get you started on a modest Chronological resume. This entry was posted on Saturday, June 22nd, 2013 at 2:05 pm and is filed under Job Search, Job Searching, Jobs, Resume Writing, Resumes. You can follow any responses to this entry through the RSS 2.0 feed. You can leave a response, or trackback from your own site. Yes, in response to a question, I can point to a few online examples of simple Chronological resumes. I’m not endorsing them, just using them as quick examples.